A Kanban card is a core element of the Kanban method. The card visualizes every task on the board and it serves as an informational hub for task’s progress. The term 'Kanban' was originally conceived by the Japanese car manufacturer Toyota. It literally means “visual sign” or “visual card”. Back in the 1940’s when Toyota used Kanban for the first time, the cards were in the form of paper notes, which were pinned on a physical board (Kanban board). Toyota workers used the kanban card system in order to create transparent work process and reduce production waste. Around 60 years later, David J. Anderson took the original idea and set the foundations of the Kanban method for knowledge work. At first, the method was implemented in the software development industry and it had an immediate positive impact on teams’ productivity. 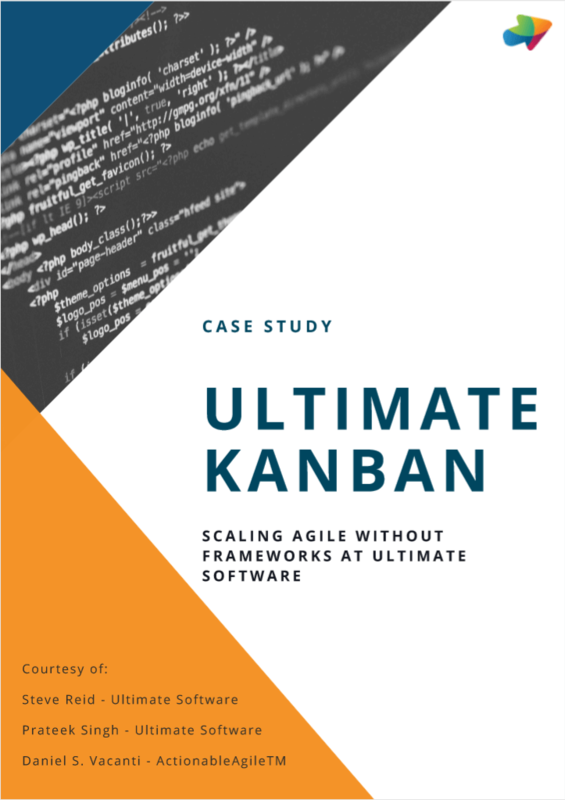 Nowadays, the Kanban method is widely spread across various industries: manufacturing, IT, software development, marketing, finances and others, this is because any team will work better, and smarter, when it is aware of the challenges not only facing it, but also those of the organization as a whole. At the heart of the system, Kanban cards are used to track and monitor work elements throughout the process. A Kanban card is a visual representation of a work item. Translated from Japanese, it literally means visual (kan) card (ban). It is a core element of the Kanban system as it represents work that has been requested or is already in progress. A Kanban card contains valuable information about the task and its status such as a summary of the assignment, responsible person, deadline, etc. An example of a physical Kanban card. Reduce the need for actual meetings. A very important aspect is that the number of Kanban cards that are in progress on the board should be limited. This way you will avoid context switching and productivity issues. Contemporary online Kanban software is loaded with many more features compared to the traditional physical boards. Now information across Kanban cards is way more accessible and provides a great advantage for both onsite and remote teams. Basically, digital Kanban cards have a front side and back side. 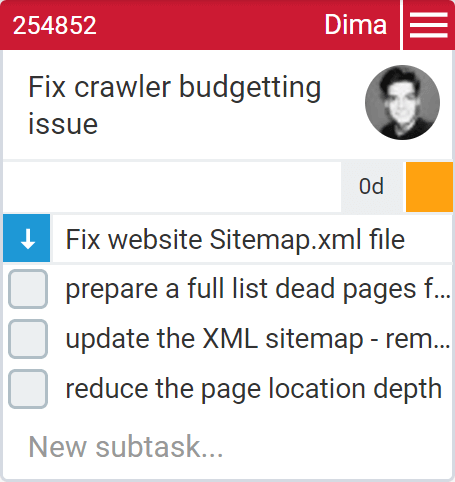 The front side gives you basic information about the task such as description, title, who has been assigned to it, cycle time, priority and subtasks. This is the visible part of a card on a Kanban board and it provides you with an opportunity for a quick overview of work items. The back side of the card can be used for recording valuable metrics and information, while it goes through the workflow. Here, your team can leave comments, attach files and external links, and also check historical data of the card. This side of a card is visible when the card is open. Different team members observe and digest information in different ways. Some prefer, or need, to see the whole data for a given task simultaneously, while others prefer to spot only the most pertinent information to their role. In this sense, good Kanban software solutions offer personal card configuration options. This means every member of a given board can configure an individual card view that fits only his/her preferences. For example, a simple Kanban card configuration that shows basic information for a task may be appropriate for daily team meetings. This way, all team members can get a quick overview of all current tasks, without going into details. On the other hand, every team member needs more information when working on an individual task. Therefore, personal Kanban card configuration that reveals the maximum amount of information can simplify the work process, improve visibility and encourage team collaboration. Kanban cards may be configured in many different ways in order to show valuable information such as deadline, cycle time, attached files, subtasks and much more. You need to find the Kanban card configuration that fits best your own working habits. 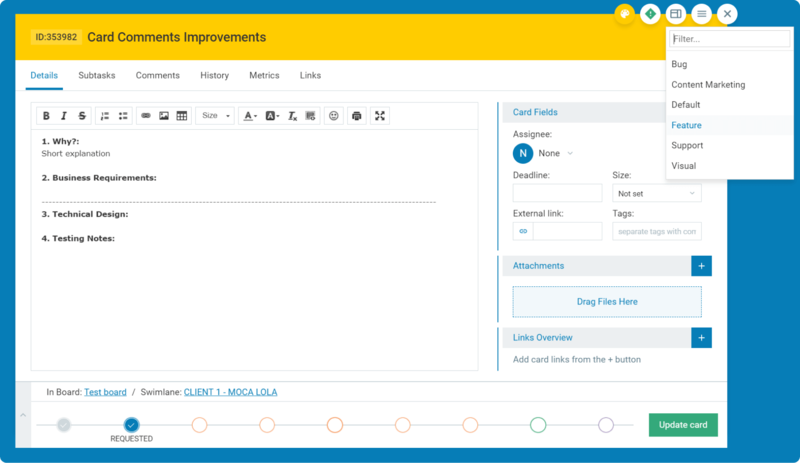 A great advantage of online Kanban software solutions is that you can use them to create different Kanban card templates. This is extremely helpful when there are recurring tasks involved in the workflow. You may consider it as a standardization that helps work of the same type and scope to be finished faster and within similar prescriptions. Kanban card templates help you avoid duplicating effort and reduce the need for rework. Templates provide all team members with a clear understanding of what needs to be done, and a familiar format for task completion – this is not, in any way intended to subdue team-member creativity, rather it allows the team to manage itself effectively and quickly recognize if assigned tasks might require special handling. 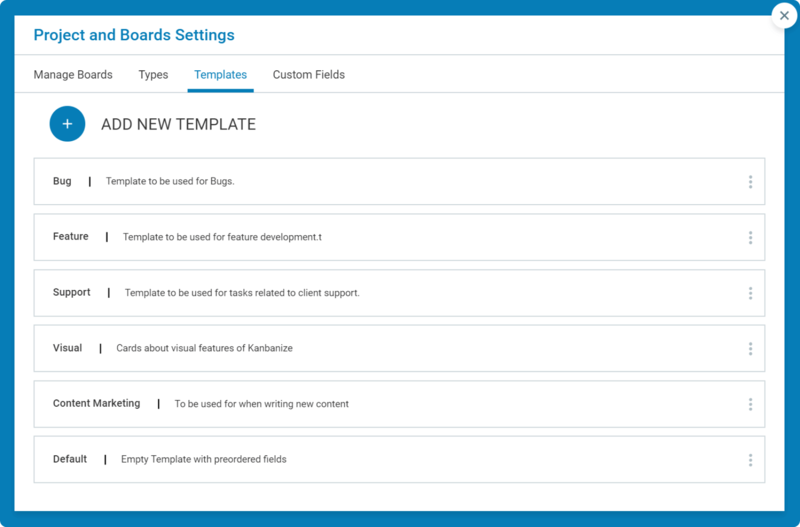 The bottom line is, when using online Kanban solutions, you can create different templates that correspond to various types of work, each with their unique focus. 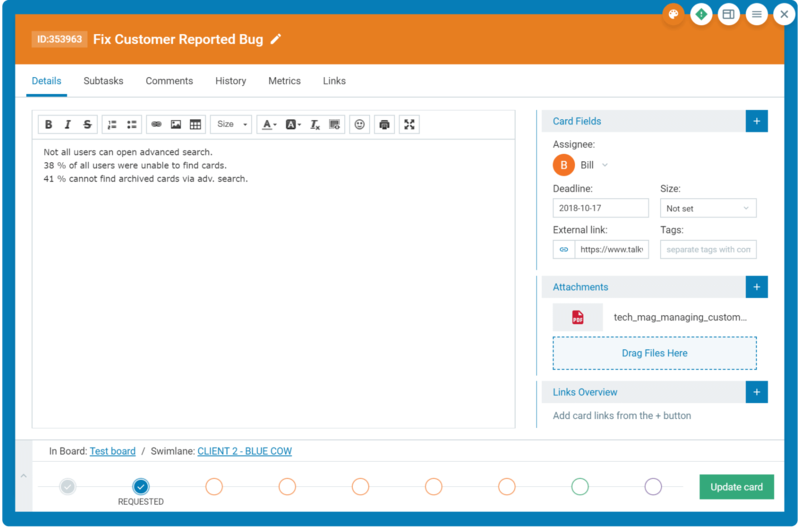 For example, you can create a “customer bug” template and every time there is a customer bug, you can just load the relevant template while creating the card. For example, you can create a “Feature” template and every time when there is a feature to be developed, you can just load the relevant template while creating the card. This way the assignee of the card will know the exact steps that need to be done, their sequence and any other notes that might assist with this style of work. Thank you for downloading our case study. If you want to hear about our product or learn more about what we do, fill the form below and our team will be in contact shortly. Kanbanize is committed to protecting and respecting your privacy. To proceed further, you need to consent to be contacted by us. I agree to be contacted by Kanbanize. Thank you for your interest in Kanbanize and our content. Here's a second download link for your convenience.